MoreNew: Project Extra: The Gun Debate How soluble is the gun problem in America? Or is the problem less about guns, but more about mental health and law enforcement? Dr. Larry Fedewa (@lawrencefedewa) provides considered insight into these questions. What has happened to our colleges in America? Many Americans have been shocked and dismayed by the lawless behavior of students on several campus protesting the Trump election. What is going on? There are two keys to understanding these demonstrations: first, these student protests are flourishing in an environment fostered by the faculties at these institutions; and second, the faculty preaches dogmas which mark a generational shift in values. The fundamental analysis therefore must begin with the faculty. Student behavior is primarily an acting out of faculty indoctrination. Administrators, while generally sympathetic to the students, are caught between angry students and their Boards and other supporters demanding a stop to these outrageous demonstrations. So, what are today’s professors teaching and why? America’s academic institutions are dominated by people who grew up in the 1960’s and 1970’s. The overarching issues of those days were opposition to the Vietnam War, which started in the universities of the time, and the civil rights movement whose champion was Dr. Martin Luther King, Jr. Both causes were anti-establishment, and both were based on a sense of moral superiority. It did not take long for the believers in the two causes to join forces. They filled mutual needs: the anti-Vietnam movement was based initially on the objections of college students (mostly white) to being required to fight in a war which was neither understood nor supported by most Americans. The issue quickly became whether the federal government had the right to draft youngsters at all. Middle America stood firmly with the government on that issue, thus spawning widespread opposition to the anti-war movement and solidifying support for the War beyond what is had been in the first place. The champion of the Middle American view was Alabama Governor George Wallace, who also had a reputation as a segregationist. What the anti-war movement needed was a cause larger than the discomfort of some white college boys. They needed a transcendent cause which they found in the civil rights movement. That cause was social justice. Specifically social justice , as interpreted to mean equality of all Americans — legally, socially, economically and morally. The civil rights movement needed white support; the leaders were aware that without it, they would never achieve their goals. It was a marriage made in heaven. The common theme of both causes was opposition to the same government which had gotten us into the War in Vietnam, which was allowing discrimination against African Americans, but which was supported by the American public. The champion of this synthesis of the two rebel causes was Bobby Kennedy. The Roosevelt Democrats (the “Old Left”) meanwhile were enacting Lyndon Johnson’s Great Society legislation, which was aimed especially at using federal tax money to assist the poor. However, Johnson also supported the Vietnam War, and thus became the target of the anti-war movement. That support spelled his doom as president. He took himself out of the presidential race in March, 1968, In April, Dr. King was assassinated. The combined support of the advocates of the Great Society, the civil rights movement, and the anti-war movement then fell to Democrat Senator Robert Francis Kennedy, who embodied the melding of the three strands of anti-establishment support. Then, in June, 1968, Bobby Kennedy was assassinated. Thus was born the New American Left, the heirs of Bobby Kennedy. In forty years, they had only one candidate for President before Barack Obama, Democrat George McGovern, who lost to Richard Nixon in a landslide in 1972. But many of those hippies and disillusioned youngsters went to graduate school and became the professors of the next generation. They did not give up their beliefs in social equality, the primary responsibility of the federal government for social justice, their disdain for American institutions including religion, business, nationalism, and the traditional family. The New Left ideology began to penetrate American society more the older and more powerful yesterday’s hippies became. In the protected enclaves of the universities and the media, their orthodoxy became more extreme and more absolute. This ideology benefited through the years from the tacit approval of many of cohorts who grew up to positions of power in other fields and who allowed their children to be taught this new orthodoxy. As the years passed, more and more of these children were persuaded by this new view of American society. In 2008, forty years after the fateful summer of 1968, they finally won their long battle for control of the American government. They elected Barack Hussein Obama as president and a Democrat Congress to back him up. It took the Great Recession to do it. But the New Left — spawned by the crisis of 1968, hardened by 40 years in the wilderness, and preaching an expanded view of human equality, anti-war idealism, anti-business bias, an anti-family and anti-religion world-view – the New Left now finally controlled the federal government of the United States of America. to pursue the ideal of a peaceful world even in the face of violent opposition and conflict, believing that all people really yearn for peace above all. These high moral goals motivate the feeling of superiority which is characteristic of the New Left, as well as the ferocity with which they attack their opponents. In the most dedicated adherents of the New Left, there is a religious fervor not unlike that which motivates the radical Islamists. Those who disagree must be defeated at any cost, even at the cost of their destruction. The New Left are not as violent as the Islamic extremists, but there are similarities. The reason for the extreme reaction of the New Left to the election of Donald Trump is that they were convinced they had finally won their generational battle with the silent majority. They were so intoxicated by the victories of Barack Obama – especially after he defeated businessman Mitt Romney in 2012 – that LOSING was unthinkable! They were confident that they now controlled the future of America. The New Left values dominated, they believed, the new American culture, never again to be denied. The Democrat Party, one of only two major political parties in the United States, had become the vessel of the New Left, and was considered by all the New Left press and pundits to be firmly enthroned as the majority party for the foreseeable future. Their agenda had already skipped over the 2016 election and concentrated on what their next priority, climate change, meant to the world. Then the deplorable Donald Trump won the presidency! His Republicans won both Houses of Congress, and most of the governorships and state legislatures! The man who has threatened to undue most of what Obama did was now in the position to do it! How could this happen? The New Left had allowed the Old Left to control the Democratic nomination until it was too late. Throughout the campaign that followed, they were continually referred to as “the status quo”, and most gallingly as “the establishment”! That critical mistake opened the door to the silent majority – who finally spoke. Does it mean, they asked, that we are now destined to return to the shadows, that we never really won the hearts and minds of the American people? That America is condemned to live forever in free market capitalism, restricted immigration, a monetary economy, a war-like world? Must we now accept the possibility that all our beliefs about the society and the nature of human beings have been false? This is what we are up against in the universities and in American society. The only way to regain control of the hearts and minds of our youth is to withdraw support for the faculties who proselytize the doctrines of the New Left in our schools. This begins with local school boards, with student-centered financing of education, with sharpened protections of free speech on our campuses, especially publicly funded institutions, and by protection of students who are in effect whistle-blowers on extremist teachers and professors. All such activities must be conducted with a careful view toward protecting the freedom of speech even of the extremists. That can only be done with a liberal use of freedom of choices by individual students (careful selection of schools and colleges and scrutiny of required courses) and of parents (school choice). Persecution of violators, however defined, would simply desecrate the mandates in the American Constitution guaranteeing freedom of speech and assembly. So, I am not advocating any witch hunts. We can only fight excesses of freedom by providing more options of freedom. But fight it we must – or we will lose another generation of young Americans! 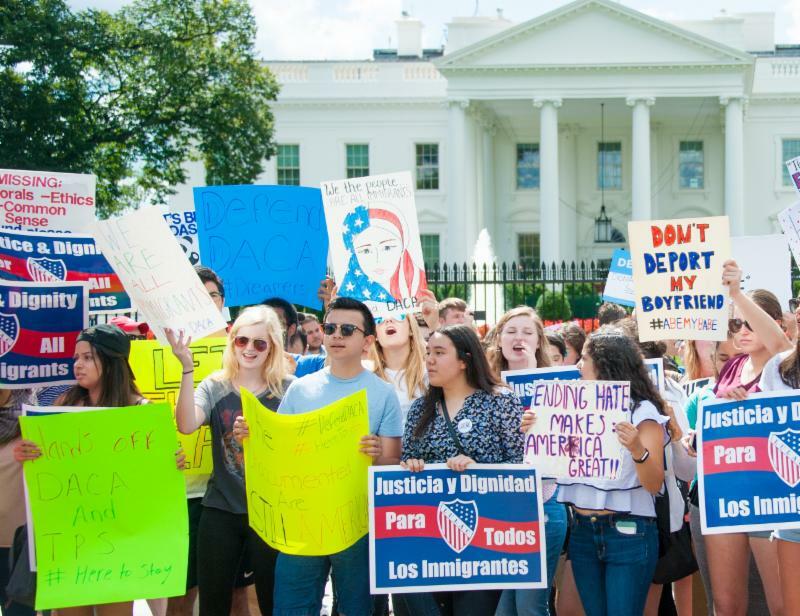 The Deferred Action for Childhood Arrivals (DACA) originally referred to a program invented by President Barrack Obama in 2014. It granted a temporary authorization to stay in the U.S. to children whose parents came to the United States illegally and who are thus officially classified as “illegal aliens”. Since this was an Executive order, not a law, its existence is dependent on the continued authorization of the new administration. For DACA to become the permanent law of the land, both Houses of Congress and the president must sign off on it. Republicans have opposed this Executive Order because they believe that the illegal actions of the parents should not be rewarded with citizenship, but rather punished for breaking American law and therefore deported to their country of origin – presumably along with their children (although this position has been softening recently). They call the Obama position “amnesty” and fear that ratification of that policy will create an incentive for more illegal immigration, in defiance of American law. There are an estimated 800,000 to 1,000,000 children of illegal immigrants living in America today, although no truly reliable estimate exists. There may be more, perhaps as many as a few hundred thousand more. What should we to do with them? As long as the future of Obamacare is still undecided, we still have time to discuss alternatives. The debate thus far appears to center on how much government subsidies should be included in the final package. Today we look again at how much government involvement is necessary (rather than how much can we afford) to achieve our national goals. With a $20 trillion national debt, a “government lite” approach seems to be in order. So, let’s look again at what a truly free market healthcare system might really look like — without the hang-ups of past assumptions. As always, comments welcome. Thank you for your support. What are the principal obstacles to these goals? a. The first and most obvious obstacle is the shortage of medical personnel. This shortage has two facets: not enough medical professionals are produced in the first place, and of those who do enter practice too many drop out before their time. There are whole areas of inner cities and rural America, for example, which have no physicians at all. Why? Because our medical schools do not graduate enough doctors to serve the population of the United States. Why not? Lack of intelligent students? Lack of students who are motivated to give their lives in service to their fellow man? Not at all. We have elections to let the people, the US citizens, voice their opinion in the form of a vote. For many years I have professed that we overthrow the current government with ballots, and not bullets. The US was one of the few countries where the loser did not have to get out of town. The loser could even still display the bumper sticker of his losing candidate, and not worry about his windows getting shattered, or his car burned and vandalized. It was OK to express your opinion, and after the election, the two parties blended together to make America flourish, make a better life for the kids and grandkids, expand the family living quarters, save up for a new car, or college. Become a journeyman at a trade, like electrician, HVAC, auto maintenance, new buildings, new roads and bridges. Politics was at least 2 years away, and the Presidential election was 4 years away. In the interim, people respected the office of the President. It was taught in our schools to do so. We rallied for or against policy, legislation bills, changes in treaties, new treaties, American involvement on the world front to keep us safe. Will there ever again be peace in this valley? So, why not? At least more than the usual suspects are passionately involved in political dialog. A whole new population is suddenly watching every step the media will let them see. A side effect of this newfound political passion, however, is the abandonment not only of objectivity, but even of common sense. At the extremes, we have attempted assassinations, riots and domestic terrorism. Less dangerous perhaps, but nearly as disturbing is the utter contempt many on both sides hold for the other. This is not the America we want to live in. What has happened to us? How did we come to this sorry state? What we have at this moment in American history is a clash of cultures, a true culture war. It did not happen overnight. This “war” has been brewing for a long time. What is different about today is its eruption into the open, into everyday life and discourse. Half of China’s public believes that military conflict between China and the United States will occur within the next 10 years. This is one finding of the 2017 U.S. China Public Perceptions Opinion Survey, (the “Survey”) published by the Committee of 100 (C100) during its annual conference, held last week in Washington D.C. The C100 is a national organization of prominent Chinese Americans, founded in 1990 by superstars I. M. Pei (architect) and Yo Yo Ma (musician) “to promote the participation of Chinese Americans in all fields of American life and encourage constructive relationships between the people of the United States of America and Greater China”.